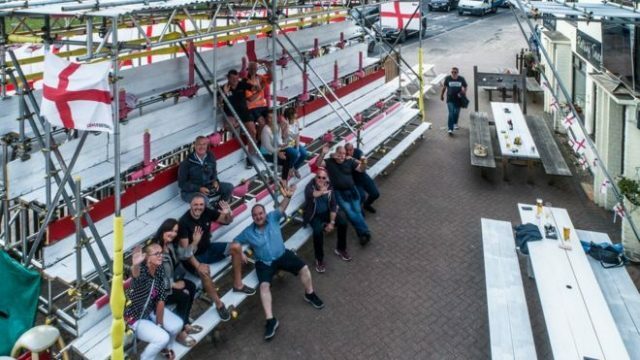 A pub landlord has spent £5,000 on building a 150-seat grandstand in his beer garden to give punters the best view of the action during the World Cup. Paul Sandford, who runs the Railway Tavern in Dereham, Norfolk, has also brought in four big screens, a DJ booth, and a separate marquee serving food and drink for the duration of the tournament, which will be up and running regardless of how long England stay in the competition. The grandstand took Sandford two weeks to build and is already proving a hit with the locals. Should England go the distance, Sandford has said he has permission to extend the grandstand into the grounds of a neighbouring garden. Sandford is also asking for charity donations from drinkers who use the grandstand.